Actress Lily Collins is seen leaving Reese Witherspoon's office in Beverly Hills, California on May 28, 2015. A well dressed mystery man was seen escorting the 26 year old British-American star. Lily Collins chose a fringed black shoulder bag for her arm candy. Lily Collins was spotted outside Reese Witherspoon's office looking stylish in a tan blazer layered over a striped shirt. 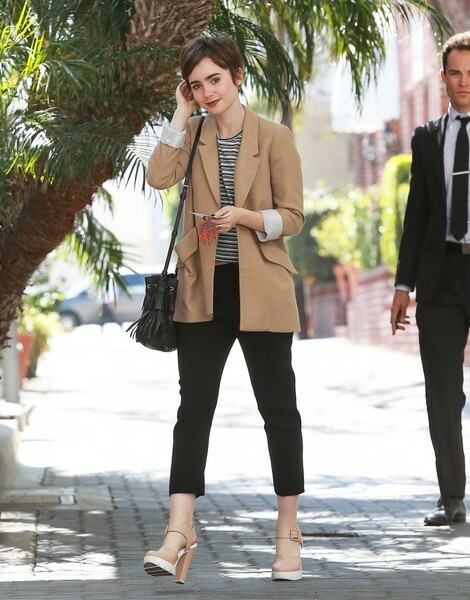 Lily Collins completed her business-chic look with a pair of black capri pants.